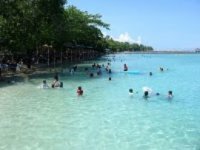 If there is one attraction that has brought the world’s attention to the Davao Region, then that would be the clean and pristine beaches particularly those found on Samal Island in the southern part of Mindanao. It is thus not surprising that the island’s bountiful beaches are doing great business. “There is actually no need to get out of Mindanao because we have a lot of destinations here,” Department of Tourism (DOT) regional director Sonia Garcia said. The reason why we keep on coming up with various events for our destinations like the Samal Island is for people not only from Mindanao but also from other areas, to get to know more about these destinations, she added. Attractive beaches are interspersed within Samal Island’s116.3 square meter area, which is populated by only 82,609 residents as of the 2000 Census. The island’s population has however greatly increased in the past years as more and more expatriates and retirees have made the island their home. This number can also pop up during the summer season when people from all walks of life and from all parts of the world trek to the island’s white sand beaches. Garcia said Samal Island plays an important role in promoting the region’s tourism. With the tagline “From the highlands to the island”, Mt. Apo and Samal Island are expected to be in the forefront of the campaign to lure tourists to the region. The thrust of the private sector now, which is being supported by DOT, is to make the expatriates who have made Samal Island their home comfortable and knowledgeable of what the island has to offer. “Samal Island has almost 40 resorts and each one is thriving thanks to the increasing number of tourists going to the island,” Davao Regional Tourism Council (DRTC) secretary Araceli Ayuste said. “We want the expatriates to help us promote the island to their respective countries,” Ayuste said. Thus, several activities are in line to keep the Samal Island spirit very festive. On top of this is the “Fun in the Sun” program. Another festival, the Caracoles Festival which will be held during the last Saturday of April, is expected to bring in domestic and foreign tourists. The beach resort owners on the island have their own marketing and promotional schemes to encourage visitors to their beach resorts. Here are some of the affordable resorts in the island which offers fun in the sun! This is one world-class resort right in Samal Island which boasts not only of its white sand but also amazing clear blue waters. BlueJaz is perhaps the only resort in the island which offers a gigantic slide for P90, free small water slides for children, free use of their swimming pool, free open cottages by the beach and reasonably-priced but high quality cottages. Owner Jazmin Middleton said they are constantly trying to improve their service and the products they offer to keep the resort very competitive. A day’s tour will cost you P90. This affordable resort which is accessible from the mainland in a few minutes by motorboat has always been active when it comes to promotional events. While the entrance fee has remained very affordable for the public (except of course the cottages which are priced a bit steeply for the common budget), Paradise Island Park and Beach Resort has always offered various forms of entertainment to its visitors. Aside from the regular Weekly Fitness in Paradise which is in coordination with the Metro Lifestyle Fitness Center & Spa, the resort has also prepared an Easter Festival for the whole family. This new resort is just near the barge area and at an entrance fee of only P50 for both adults and children. It is one of the most affordable destinations in Samal Island. Huts will cost you P150, while there are Bahay Kubos with bathrooms for unlimited number of persons for only P2,000. The Resort offers camping grounds, waterslides, beach, playground and a restaurant. This is one of the barest but still comfortable beaches on Samal Island. Development in the area has been kept to a minimum which will appeal to those who love to commune with Mother Nature. The entrance fee is only P120 for adults and children for day tour, or P220 overnight. Cottage rates range from P2,500 to P5,000 depending on capacity. Among the amenities are table tennis, darts, billiards and volleyball, which will cost you from P35 to P100 per hour. This resort is actually located in Talicud Island or at the back of Samal Island. This resort offers one of the most affordable rates at only P75 per head for adults day tour, P150 (adult) and P75 (kids) overnight. The good news is that they offer discounts for kids from four up to 10 years old. Kids below three years old are free of charge. There are actually more beach resorts on the island than we can enumerate. Visiting all these resorts can be a challenge even for the sun worshippers.